By next fall, the beginnings of a campus entrepreneurial venture will be fully brewing. 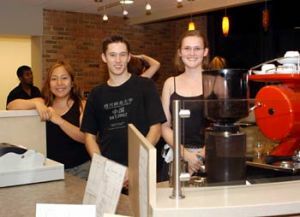 In a unique partnership, Goshen College Student Life and Business departments are offering students the opportunity to manage a new coffee bar, the "central focus of the connector" between Yoder, Kratz and Miller residence halls which is currently under construction, according to Bill Born, vice president for student life. During the 106th Goshen College commencement weekend April 24-25, students not only received degrees to honor their hard work, but were also able to celebrate and reflect. Acknowledging shared community, national and international events with significant impact on their lives during their undergraduate years, the chosen theme for their commencement "Creation groaning, yearning for peace, embodying hope."